Well I am here today, on this lovely Thursday morning to share a card that I made for a challenge that is very new to me. I know that Splitcoaststampers hosted challenges, but I never played or inquired until this week. WOW...they have great challenges and of course I love sketches, so when I saw this weeks challenge, I had to play. Here is what I came up with. For my card today, I am using The Sky's the Limit stamp set from Inspired by Stamping. 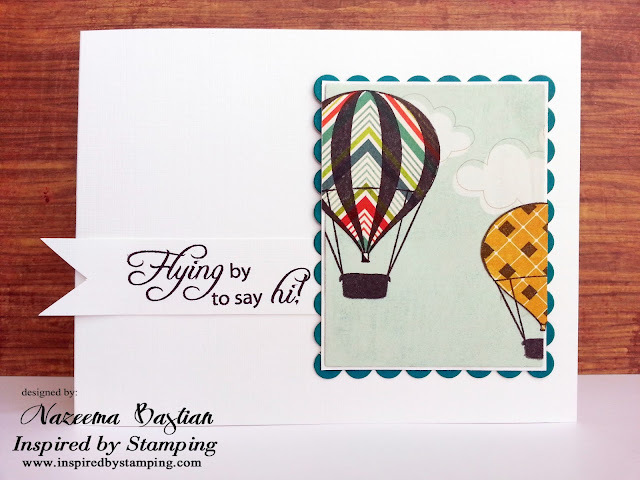 I love these stamps and the different array of patterns that each balloon has, along with the beautiful sentiments, which are all so perfect for any occasion. This is such a cool card! I love the look of those ballons, GREAT JOB! Fabulous use of this IBS set, Calypso! It's so creative.